Cap up to 15 cm, hemispherical then convex, flat-convex or almost flat, initially dry, velvety, later smooth, lemon to bright yellow, yellowish ochraceous, in young fruitbodies more or less uniformly coloured, later spotted brownish, strongly blueing when bruised, then blackening. Stipe clavate, concolorous with the cap, covered with scattered yellow to brownish granules, surface blueing and then blackening when bruised. Flesh lemon yellow, sometimes with dark red spots in the stipe base, blueing when exposed to air. Tubes lemon yellow to yellow with olivaceous tint, blueing when exposed to air. Pores concolorous with the tubes, blueing when bruised. Smell not distinctive. Taste slightly acid. 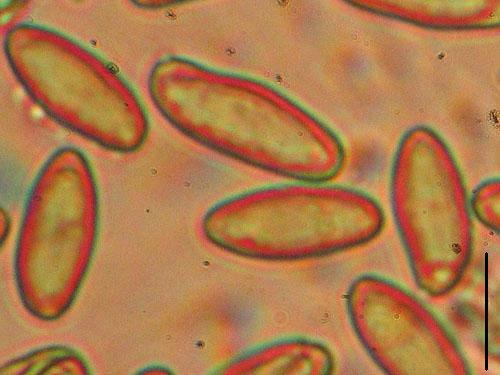 Spores 12–16.5 × 4.5–6 μm, ratio 2.2–2.7. Pileipellis (the cap cuticle) a trichodermium of interwoven septate hyphae of cylindrical, not incrusted cells. Chemical reactions: hyphae of the stipe base inamyloid. Habitat. Broadleaf forests, mycorrhizal with oaks (Quercus) or beech (Fagus). Distribution. In Europe seen occasionally. Similarity. Compare with Boletus luridiformis var. discolor, which has similarly coloured fruitbodies, but features orange pores. Note. 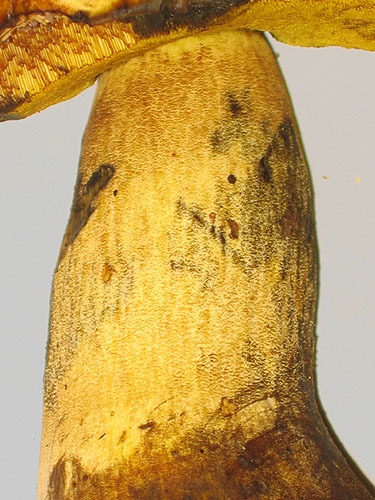 Some recent autorities reduce this species to a variety of Boletus luridiformis on the base of unpublished molecular studies. It is clear that the entity in question is close to Boletus luridiformis. Nonetheless, here I intend to keep it at species level until published study is available for this confusing group. This species was long time known under the name Boletus junquilleus (Quél.) Boud., but due to confusion in the past it will have to be abandoned in favor of Boletus pseudosulphureus. In fact the original description of Boletus junquilleus and the later illustration in Boudier’s Icones Mycologicae fit well the species in question. 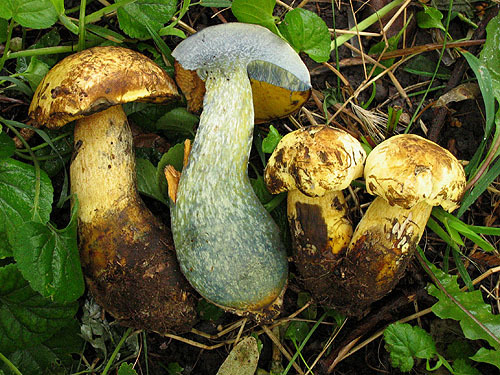 Especially in Britain the name B. junquilleus was applied to Boletus luridiformis var. discolor and this is exactly where this confusion came from. 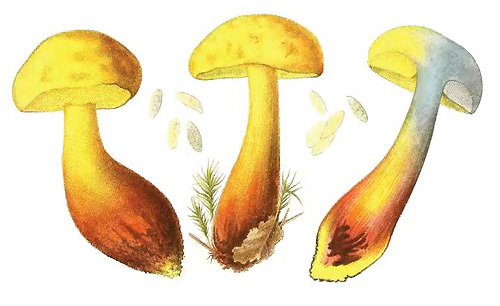 The illustration of Boletus junquilleus published in Boudier's Icones Mycologicae. See the note above, concerning the name B. junquilleus. Kallenbach, F. 1924. Boletus pseudo-sulphureus n. sp. – Annales Mycologici 22: 239–244. Klofac, W. 2011. Boletus pseudosulphureus, der gültige Name für den teilweise fehlinterpretierten Boletus junquilleus? [Boletus pseudosulphureus, the correct name for the partly misinterpreted Boletus junquilleus?]. – Österreichische Zeitschrift für Pilzkunde 20: 53–72. Mattock, G. 1997. Boletus junquilleus – some recent records from Hampshire. – Mycologist 11: 135–136. Reid, D.A. 1968. Fungorum Rariorum Icones Coloratae. Vol. 3. Pp. 1–34. J. Cramer, Vaduz. Watling, R. 2004. New combinations in Boletaceae and Gomphidiaceae (Boletales). – Edinburgh Journal of Botany 61: 41–47.